This book is meant to be a reference text for researchers in the field as well as an introduction to graduate students wishing to get some exposure to this subject. Libraries. Graduate students wishing to get some exposure to this subject. 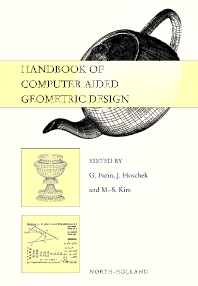 Chapter 1: A History of Curves and Surfaces in CAGD (G. Farin). Chapter 2: Geometric Fundamentals (W. Boehm, H. Prautzsch). Chapter 3: Geometries for CAGD (H. Pottmann, S. Leopoldseder). Chapter 4: Bezier Techniques (D. Hansford). Chapter 5: Rational Techniques (H.J. Wolters). Chapter 6: Spline Basics (C. de Boor). Chapter 7: Curve and Surface Constructions (D. Hansford, G. Farin). Chapter 8: Geometric Continuity (J. Peters). Chapter 9: Splines on Surfaces (M. Neamtu). Chapter 10: Box Splines (H. Prautzsch, W. Boehm). Chapter 11: Finite Element Approximation with Splines (K. Hoellig). Chapter 12: Subdivision Surfaces (M. Sabin). Chapter 13: Interrogation of Subdivision Surfaces (M. Sabin). Chapter 14: Multiresolution Techniques (L. Kobbelt). Chapter 15: Algebraic Methods for Computer Aided Geometric Design (T.W. Sederberg, J. Zheng). Chapter 16: Scattered Data Interpolation: Radial Basis and Other Methods (S.K. Lodha, R. Franke). Chapter 17: Pythagorean-Hodograph Curves (R.T. Farouki). Chapter 18: Voronoi Diagrams (K. Sugihara). Chapter 19: The Medial Axis Transform (H. I. Choi, C. Y. Han). Chapter 20: Solid Modeling (V. Shapiro). Chapter 21: Parametric Modeling (C. M. Hoffmann, R. Joan-Arinyo). Chapter 22: Sculptured Surface NC Machining (B. K. Choi, B. H. Kim, R. B. Jerard). Chapter 23: Cyclides (W. Degen). Chapter 24: Geometry Processing (T. A. Grandine). Chapter 25: Intersection Problems (N. M. Patrikalakis, T. Maekawa). Chapter 26: Reverse Engineering (T. Varady, R. Martin). Chapter 27: Vector and Tensor Field Visualization (G. Scheuermann, H. Hagen). Chapter 28: Splines over Triangulations (H-P Seidel, F. Zeilfelder). Chapter 29: Kinematics and Animation (B. Juettler, M. G. Wagner). Chapter 30: Direct Rendering of Freeform Surfaces (G. Elber). Chapter 31: Modeling and Processing with Quadric Surfaces (W. Wang).